Pleased to announce my new qualification as a Pilates Instructor! I’ve passed my Level 3 Diploma in teaching Mat Pilates. Pilates is an excellent form of exercise to help target a myriad of physical and emotional well being needs. 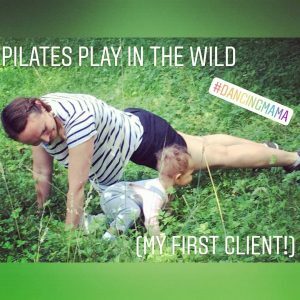 I’ve found it so beneficial in helping me regain my core strength after having the baby – wish I’d have practised more during my pregnancy too. I love the feeling after a Pilates class – the only way to describe it is ZEN! Chilled, rejuvenated and STRONGER. I notice the tone returning to my muscles instantly, sculpting the shape of my body. It’s a little like meditation for me as for an hour or so I’m just focussing on the smooth, fluidity of my body movements and all the muscular actions and changes through each exercise. Some might see Pilates as sedative – in fact the slower the movement, the deeper and more effective the action towards developing strength, whilst minimising the possibility of injury or muscular tearing. In my classes I’m going to combine Pilates principles with dance conditioning exercises. Pilates and dance go perfectly hand in hand. I first discovered Pilates in my dance training at Trinity Laban. They have a great Pilates studio there. Joseph Pilates himself rehabilitated many dancers back to strength from injury – his methods for them being quite powerful and advanced to service the demands of athletic bodies. Prior to which he helped injured world war soldiers by adapting the hospital beds into, what we know today as ‘reformers’ – the larger Pilates equipment, assisting exercises by providing resistance – to aid recuperation. His methods helping people with different needs demonstrates the power of Pilates for different ages, health conditions and levels of strength and fitness. Contact me here for more information about small group and 1:1 Pilates Tuition!